When Allison Pearson’s novel I Don’t Know How She Does It came out in 2002, I thought the story about frazzled working mom Kate Reddy was pretty funny, so I was looking forward to the movie version. I don’t think it was quite as awful as the reviews led me to expect, but the book was better. What didn’t disappoint: the fabulous Boston townhouse that Sarah Jessica Parker’s Kate lives in with her handsome hubby (Greg Kinnear) and their two kids. Let’s take a closer look! The book written by Allison Pearson was based on a newspaper column she wrote about the challenges of being a working mother. In the novel, Kate was a Brit living in London and traveling to New York for her job. Anyone else read it? The townhouse interiors were built at Cine Magic Riverfront Studios in Brooklyn. 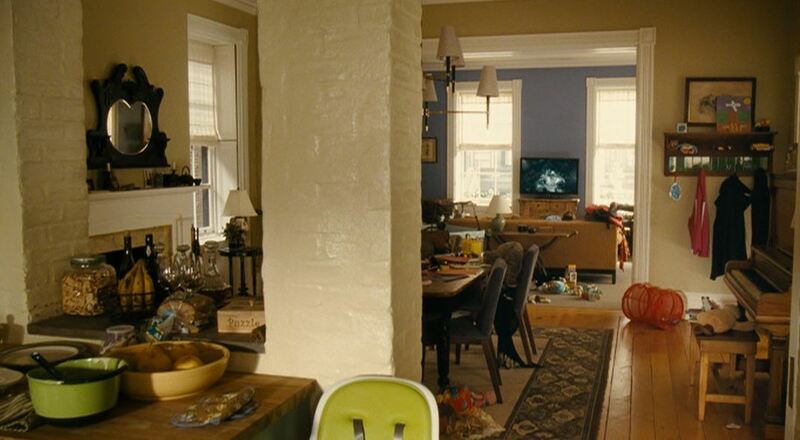 The set decorators were sure to include plenty of “family clutter” in every room. The house may be beautiful, but it’s far from pristine or perfect. It looks lived in! “Kate and her (underemployed or unemployed) architect husband Richard…live in a huge, gorgeous townhouse in the most picturesque and expensive corner of Brooklyn Heights, with high ceilings and beautifully eclectic furnishings and an amazingly huge and gorgeously appointed kitchen that’s flooded with sun and would put the Williams-Sonoma catalog to shame. Hollywood has never let reality get in their way when filming a chick flick like this, though. We’ve come to expect our heroines to live in a fabulous house and be courted by men like Pierce Brosnan, even she meets him with lice in her hair (makes my head itch just thinking about that scene!). This makes me want to see the movie now! You’re right – a little cluttered but love the architecture and the kitchen. Okay… Okay… I know my house gets “messy” with two girls and a husband… but it is never that messy! 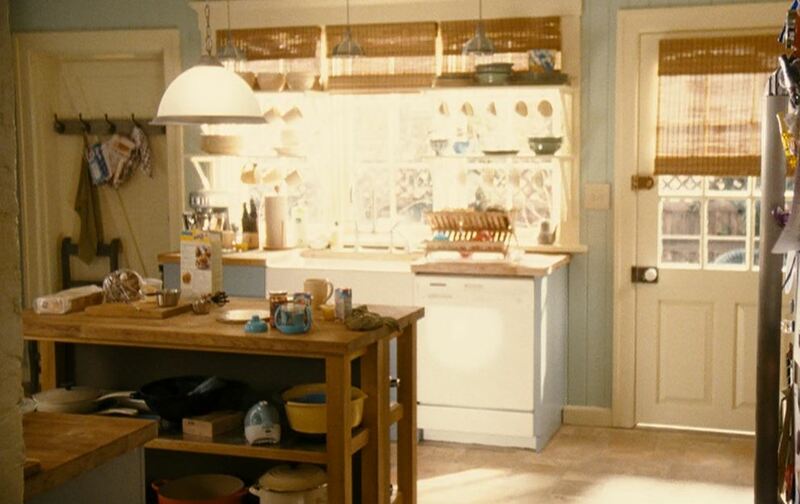 But I must say… the set looks like it was a real life everyday life home. The decor in the house is awesome!! I love it and that kitchen…. love the placement of the stove/range. This is not really “me”, but I can admire so many charming elements in this place. Besides, I always love seeing “movie” homes. I don’t remember it being such a mess in the movie (but that actually makes me feel better–personally). 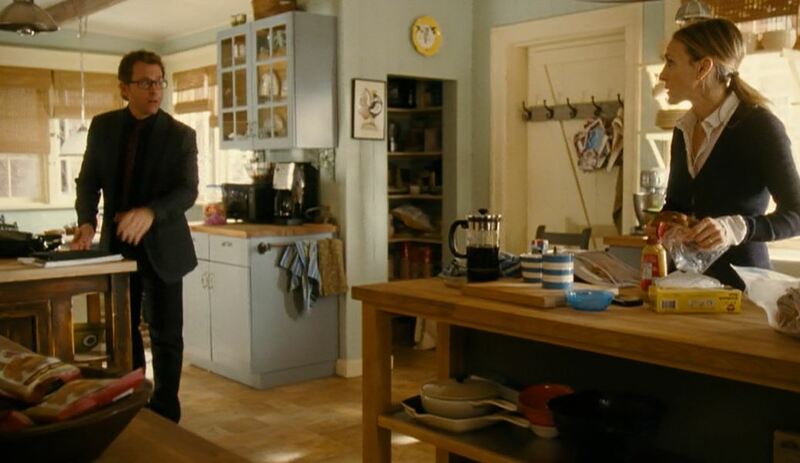 I really liked the house–I spent alot of time looking at it in the background. The kitchen was my favorite, too. Always watch the movies for the settings and the wardrobe. I’d watch the worst movies if it has a pretty house. I love how the range is set into a fireplace alcove. That’s one thing I’d love to do in my kitchen. Never saw the movie but now I want to. I love the kitchen too. Our living room is painted the same color as theirs ; the first time I have seen someone else paint it that color. I loved the book much better than the movie, but I didn’t hate the movie as much as some of the reviews. I felt the movie was more *inspired* by the book than a version of the book. 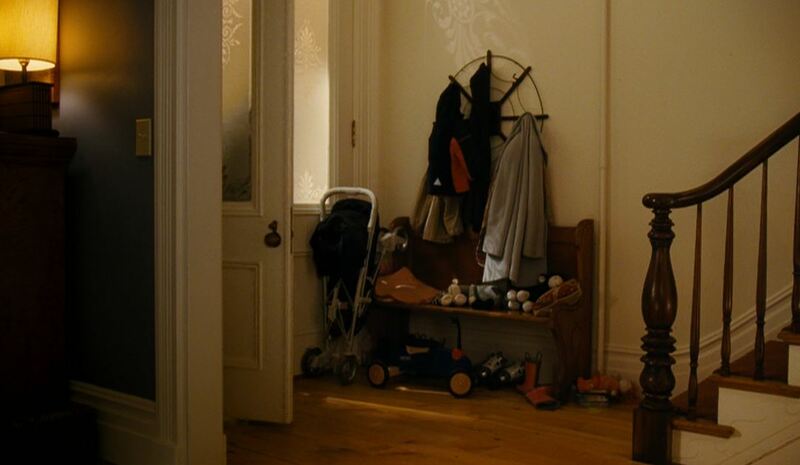 Anyway….loved the house…the clutter, the lighting. Although it’s not how I would personally decorate, I still love and appreciate others taste! Love these pix–reminds me of home. Especially the front hall! Great pantry, but not much else in the way of closed storage in the kitchen. With all the stuff on open, low shelves, no wonder it’s chaotic–can you imagine a toddler in there? Haven’t seen the movie, but will now. I love the old rustic elements of the apartment with the exposed brick walls. They did a great job of passing Brooklyn off as Boston. I didn’t see the movie, but love this house. It does look really lived in, but I guess it fits the story. Something has to give with work, being a good Mom,etc. I really like that hutch off the kitchen. It looks like it could have been a hand me down or something..really homey and sweet. Greg Kinnear is the cutest! I Don’t Know How She Does It is one of my favorite books — if any of you haven’t read it, I highly recommend this book. I’m from Boston — well, the suburbs of Boston — and I’ve always wanted to go inside one of those gorgeous Backybay townhouses. This one seems believable to me — gorgeous, but cozy enough to be believable. The brick nook where the kitchen stove is located is really attractive – almost looks like an old cooking hearth! Makes me want to see the film although I haven’t been crazy about SJP’s latest films. A great house is plenty of reason to see a so so film. But the book…now that I really want to get my hands on! I love these movie-house blogs! They remind me so much of articles describing the photoshop that went into pictures of models and movie-stars….it ain’t what you think and nobody regular person can be/have that. Would you mind if I blogged about this and shared your blog? Didn’t read the book, but saw the movie. My husband and I loved it. So refreshing to see a couple actually work at their marriage. Great digs too. 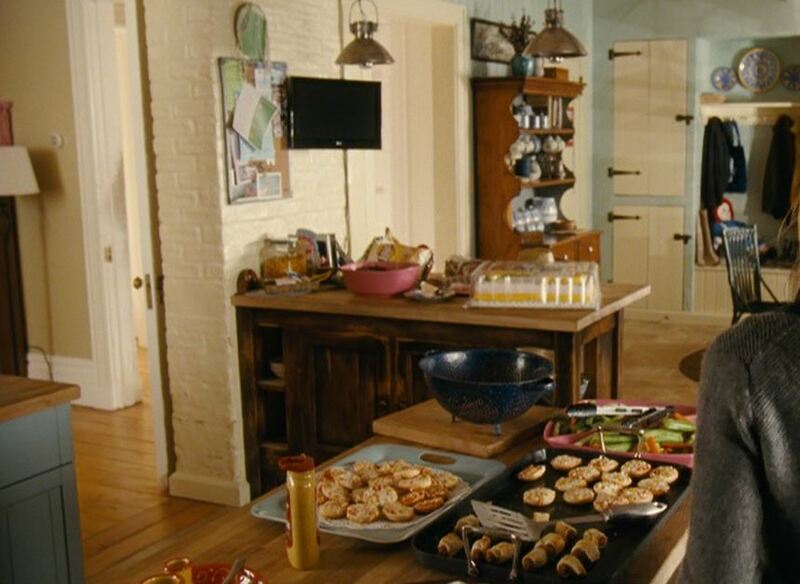 That kitchen with the brick…heaven. They did a great job making the place looked lived in and homey. We watched this movie last week and I went crazy over her kitchen. I was so excited to see you post it today! Definitely one of my favorites. I did read the book (and enjoyed it). I’m looking forward to watching the movie on pay-per-view, but I need to find a night when my husband is occupied as he’s not interested. I definitely watch movies just for their settings sometimes. I read the book back when it first came out and enjoyed it. I thought the movie was OK. I did love the house and the clutter. Not too fond of the shelves in front of the windows in the kitchen. I wouldn’t want that in my own home. The portrayal of stay-home mothers in this movie really irritated me. They were so judgmental and self-righteous. Most stay-home moms I know do not have that attitude. I was a SAHM before working after the kids were older and then a SAHM yet again after an adoption but I digress. I never judged working mothers or SAHMs and just don’t get that mindset. And living at the gym? I didn’t know any SAHMs who did that! I haven’t seen this movie or heard of the book, but the sets are gorgeous. I wouldn’t mind living in a town house like this. A movie with a gorgeous house that I think is a townhouse, but I’m not quite sure is “It Started With Eve” made in 1941. The house has two double staircases and sets are gorgeous. I have the movie on dvd and I love it. It has such a fun story. I also love the sets from the tv show “The Nanny”, but I know how hard tv shows are to do. I did read the book and liked it very much. I missed the movie, so will now have to watch it. I do like both the lead actors, and, methinks I will like the interior of this house also. Thanks, Julia, for this post. All that clutter would drive me nuts! Ha I can’t even see past it to look at the house. Love the “unfitted” kitchen look. I have it in mine, but my kitchen’s about a third of that one! The house is quite charming! It was very fitting for the movie. I just added the movie to my queue. I read the book, but it was a long time ago and I don’t remember much about it other than I liked it, but didn’t love it. I DO love the way the stove is tucked into the fireplace. I really want to do that in my own kitchen. The old central chimney is directly behind my stove so we might actually be able to do it. Thanks for showcasing this movie house, Julia! I really enjoyed the movie when it came out – with one exception: I took issue with the way they portrayed SAHMs as snarky, self-consumed gym addicts who perceive working moms as the enemy. Other than that it was funny, relateable AND had awesome sets. I totally covetted that townhouse the entire time! Julia! I just love your blog and I read it every day! Your Movie Monday posts are some of my absolute favourites! After I read Kate’s post at Centsational Girl today, I came over and re-read the post on Aunt Meme! There is nothing better than an old Hollywood movie and I just love how you take us back to visit those times in more detail! Wishing you a wonderful week! Angie xo ps~ have you ever considered writing a book? Love the kitchen. Who wouldn’t with all that space? I really like kitchens with furniture instead of modern built-ins. But ya gotta have the space to make that work. Hi Julia I haven’t seen the movie yet I’m waiting for it to come out on DVD (I wish it would hurry up already) after looking at all these pics thank you for sharing. The kitchen is beautiful. The home looks lovely even with all the mess. I went to see this movie specifically FOR the sets, as I knew they would be great. But, I sure didn’t know the set was in Brooklyn. I would like a little more reality in these movies, and if a place like this costs $4 million, then Hollyweird needs to tone it down. didn’t see the movie – but I agree – the kitchen is gorgeous! Loved the shade of blue on the cabinets. I am not a neatness freak but the clutter was a bit much. Just thinking of cleaning it! I have a relatively clean home due to basic laziness. I’d rather not have it build up or I’m sunk. The movie was pretty cute and I loved the female cast. I don’t mind unrealistic sets as long as they are beautiful. Her house was definitley cool and I loved the periwinkle in the living room. I hated the movie and loved the book and I really don’t understand why they changed the setting from London to Boston. A London row house would have been just a interesting and gorgeous. Why waste 2 hours of my life on a bad movie when I can just come by and check Julia’s blog and get all the house pics?! I am so happy you did this movie! 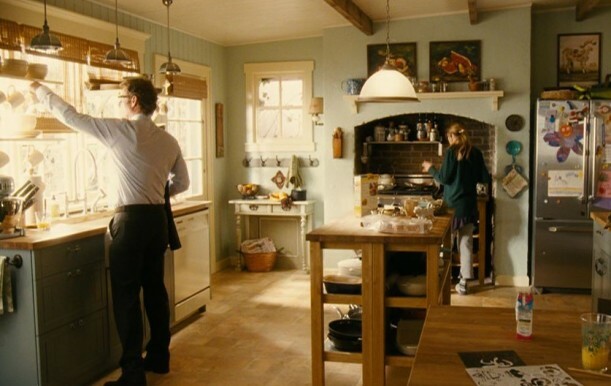 I have been obsessing over that kitchen for some time now. 🙂 Thanks!! i like the comfortable, lived-in feel that this home has! the designers did a great job, and that kitchen is just to die for! it’s really architecturally interesting, yet doesn’t seem over the top. here is the link… I was the set decorator on the movie and love all the compliments!! Hey… what about the light fisxture that looked like a cream colored, puffy, blooming flower? Similar to this one, but more refined. Seemed to have a metal grid at the top where the “petals” were attached. Hello- Not sure which one you mean. Do you remember which room it was in? There was a capiz shell light fixture in the bedroom, but I didn’t think it was shown- let me know I’ll try to help. Do you have the paint colors that you used in the movie? I love the blue living room and the color used in the dining room. Carol: I love the blue paint! You said its the same color you have? Mind sharing the color name?? 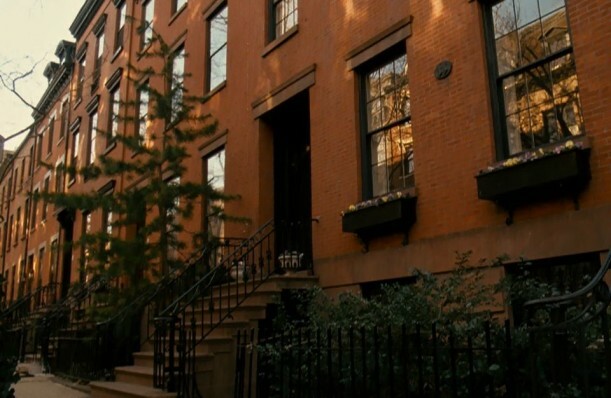 I didn’t really care for the movie, but I’m a sucker for a “Boston” townhouse – or any townhouse, really! People invest in property everyday. So for this family to own such a building is nothing new under the sun. Finally, watched the movie, and as soon as it finished I had to come right here because I knew you would have all the details! 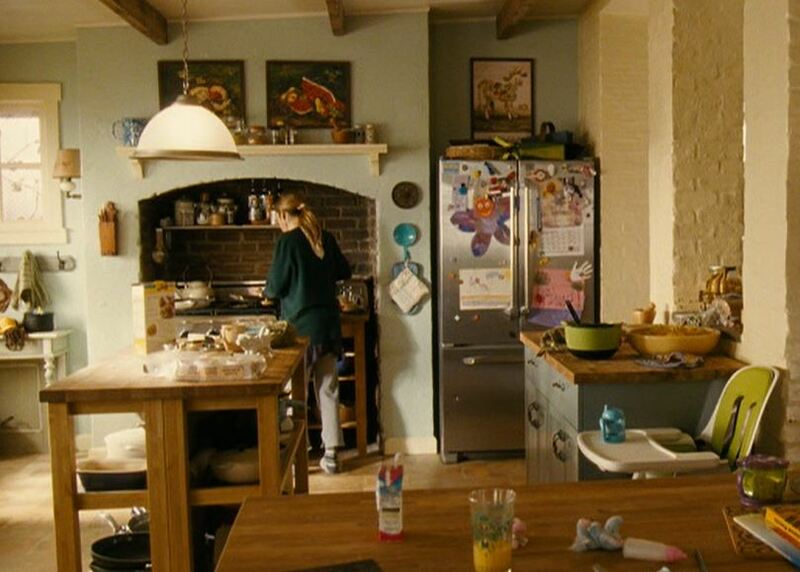 I loved, loved, loved this house, and the kitchen is also one of my favs, too! I thought the movie was cute enough, but I really loved the sets/house. Also, I thought that SJP was just a tad old to be playing the mother of such young children. I love Pierce Brosnan, and it was nice to see Kelsey Grammer. I liked the movie. I didn’t like the women, Busy Phillips and this other one that were total jerks to her because they were apparently jealous that she has a very successful career, she’s married and has a child and she’s doing the best she can. That is not an easy feat. So that’s that on the movie portion. I think the brownstone was actually cute. Not bad. Once again I look it over and see many things I would do differently. But otherwise not bad at all. I love Boston so much I would have been happy living there. That looks like the area near all those old brownstones in a pretty affluent area in the city.. I can’t remember the name right off.. But I’ll call my family. They all live there.. Love it!! About the movie – I dont know how she does it. I just saw the movie last night and wanted to ask. Do you have pictures of the house that the family visits? The husbands parents house? 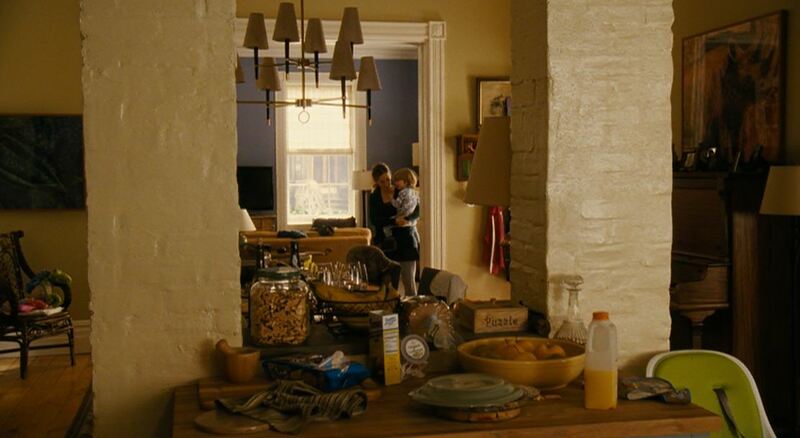 Their kitchen looks real decent. I liked the way it was shaped to face the dining table. Sorry, these are all I have.